Three Ocean Partners has a unique partnership with Petra Nemcova's Happy Hearts Fund, whereby a portion of our fees from completed assignments will be used for the construction of new schools in our clients' names in areas following natural disasters. VIEW PHOTOS FROM THE SIGNING CEREMONY AT THREE OCEAN PARTNERS' HEADQUARTERS. In our program's inaugural year, we built two schools on behalf of our clients, one in Haiti and one in Peru, and have committed to building a third this year. While we believe it is important for social giving, it is also a differentiating characteristic and part of our strategy to build our reputation, strengthen our franchise and make Three Ocean a unique firm in the industry. The response from both clients and employees has been extremely positive. Ecole Foyer des Archanges is a prekindergarten through 6th grade school in Cité Soleil, one of the largest and most impoverished slums in Haiti. It was severely damaged during the earthquake of January 2010. The 200 children who lost their school were studying in tents for nearly two years. 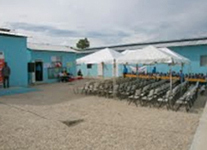 The school was re-opened in October 2012 with ten, beautiful classrooms and a play area for children. The Divino Nino Jesus School was damaged by the 2007 earthquake in Ica, Peru. After the earthquake the students were forced to attend classes in a prefabricated structure that was getting very hot and unhealthy during the summer. The school was re-opened in October 2012 and is now attended by 340 children!